Jehovah’s Witness and Mormon, both are orthodox Christian denominations driven by common ideology of restorationism or primitivism Christianity. The founders of the denominations subscribed to the view that Christianity and the affairs of Church should be restored along the line of early period apostolic church in order to re-establish the pure and ancient form of the religion. Both the denominations look at the primitive church as the normative model to fix the faults and deficiencies in the application of Christianity. In spite of the common ideological commitment, the two denominations have a number of differences between them. This article focuses on some of the distinct differences between the two denominations. Jehovah’s Witnesses: In 1870s, Christian Restorationist minister (church appointed preacher and overseer of religious and social ceremonies) Charles Taze Russell (1852 – 1916) founded the denomination in US. The concept was crystallized by the Bible Student Movement which was spearheaded by the followers of Russell. During 1880 to 1900 the movement was spread in England by the missionaries of Bible Student Movement. Within a span of fifteen years the movement spread to Canada, Germany, Australia, France, and other European countries. Russell used The Watch Tower magazine under his editorship and his own legal & publishing corporation namely The Watch tower Bible & Tract Society of Pennsylvania to spread the messages of Christianity in general and that of Jehovah’s Witness in particular. After the death of Russell, the reign of the movement passed into the hands of Joseph Judge Rutherford. Rutherford introduced a number of doctrinal changes in the movement and alienated the organization from the influence of Russell’s followers. During 1930s the movement grew rapidly and the name Jehovah’s Witness was adopted in place of Bible Student Movement. Russell introduced absolute centralized control of the movement and made some striking amendments in the charter of Watch Tower which seemed controversial in the eyes of mainstream followers of Christianity. The sect was banned in Canada during WW I and during WW II the denomination members were barred from practicing the religion in Germany, Canada, Australia, and Soviet Union. The members of Jehovah’s Witness were persecuted in US, Canada, Russia and other countries. After Rutherford’s death in 1942, Nathan Homer Knorr, more democratic in thinking, became the President of The Jehovah’s Witnesses. Knorr transformed the centralized individual leadership to corporate leadership. In 1976, the leadership structure of Jehovah’s Witnesses underwent further change with the power or presidency passing to the Governing Body of Jehovah’s Witnesses. Till 2014 there have been changes in doctrine as well as organizational structure of the denomination. The successive presidents of the society after the death of knorr were Frederick William Franz (1893-1992) and Milton George Henschel (1920-2003) and the present incumbent is Don A. Adams. As on August 2014, there were about 8.2 million Jehovah’s Witnesses all over the world. Mormons: The Church of Jesus Christ of Latter-day Saints, more popular as Mormon Church is an orthodox Christian sect that was founded by Joseph Smith in 1830 CE in New York. Joseph Smith was a self proclaimed messenger of God, who claimed to have been instructed by God to restore the Church that Jesus Christ established but the tradition was lost after the death of the apostles. According to Joseph, messengers of God visited him and conferred upon him the holy authority to baptize Christians. Joseph strongly recommended polygamy as a part of restoration process of medieval Christian practices in the modern day Christian practices. Joseph also claimed that angels from heaven directed to a location underneath the ground where he found the book of Mormon, and which he translated from a very ancient language. The book contained description of pre-Christ primitive people who believed in Christ, before Christ was born. During the period 1830 to 1840, the Mormons were hunted and persecuted by non-Mormons and followers of mainstream Christianity. After Joseph Smith was murdered by some non-Mormon Christians, the baton of leadership passed on to Brigham Young, who by his organizational prudence navigated the sect to the security of West America. Under the leadership of Young, the Church vehemently propagated polygamy by devoted Christians. This bizarre practice was the bone of contention with US Congress and also Catholics and Protestants. Throughout the 19th century, this single practice of plural marriage remained signature characteristic of the sect. However, in 1860 in the face of stiff resistance from within the Christian society, the then President of the Church Welford Woodruff announced the end of the plural marriage doctrine. After this several smaller groups within Mormon broke free from the LDS umbrella and formed denominations with Mormon fundamentalism. During 1880s Mormons were subject to state discrimination and even jailed and in some areas their voting rights got forfeited. After WW II, Mormon Church started to register international growth, mainly in South America, South Africa and erstwhile Soviet Union. In 1995, Gordon B. Hinckley became the president and prophet of the Mormon Church. Membership of Mormons surpassed 13,000,000 and by 2000 there were more than 100 Mormon temples were built in China, Japan, Philippines, America, Africa and all over Europe. Neither of the groups believed in the mainstream Christianity concept of trinity (God, Father, and Holy Spirit). But their ideas about God, Jesus and Holy Spirit are different from one another. Mormons consider worship God, Jesus and the Holy Spirit as separate persons and worship all of them. Mormons believe that all humans are God’s children like Jesus Christ whom they know as Jehovah in the Old Testament. Jehovah’s Witnesses believe that the Only God is Jehovah who’s only son is Jesus and Jehovah created all human beings. They consider Jesus as less than God. Unlike Mormons, they don’t believe Holy Spirit as a person but the power of God. 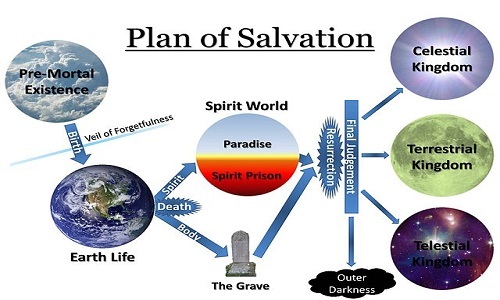 Mormons believe that with death body and soul are separated and the soul continues to live to be resurrected or re-united with the body and that all people are resurrected by Jesus Christ and assigned to a kingdom of heaven. Jehovah’s Witnesses believe that after death the spirit goes to sleep. As Jesus Christ comes back to earth, the sleeping souls of righteous Jehovah’s Witnesses will be resurrected, but only 144,000 people will be resurrected to the heaven and the rest will live in earth peacefully forever. Both the denominations believe that after a massive turmoil on earth, Jesus would come back and reign as a king for 1000 years. But the two sects differ in their beliefs as to how Jesus will come back and what will happen after that. Mormons believe that Jesus will make a glorious come back, and everybody will come to know about it. The wicked people will be destroyed and only people with good deeds, both Mormons and non-Mormons will live on earth. During the 1000 year rule of Christ, Mormons would be doing God’s service, and after a final battle with the evil, the earth will be transformed into a celestial kingdom. Jehovah’s Witnesses believe that Jesus has already come back in 1914 and will be visible at some time when all non-Jehovah’s Witnesses would be killed and earth will become perfect. The Jehovah’s Witnesses would take care of the earth for eternity as Adam & Eve did in the Garden of Eden. Mormons consider the King James Version of the Bible, the Book of Mormon, the Doctrine & Covenants, and the Pearl of Great Price as their scriptures, whereas Jehovah’s Witnesses consider the New World Translation of the Bible as their Scripture. As regards medical practice Mormons have no reservations, whereas Jehovah’s Witnesses do not permit blood transfusions. Mormons encourage active participation in politics, government and military, whereas Jehovah’s Witnesses abstain from participating in politics or military services. Mormons celebrate religious holidays, birthdays, anniversaries, and other special occasions, but Jehovah’s Witnesses do not celebrate any such occasions including Jesus’ birthday. Mormons mandate all members to donate one tenth of income to the Church. No such mandate exists in case of Jehovah’s Witnesses and all donations are voluntary and the donors are anonymous. tapas. "Difference Between Jehovah’s Witness And Mormon." DifferenceBetween.net. September 27, 2017 < http://www.differencebetween.net/miscellaneous/religion-miscellaneous/difference-between-jehovahs-witness-and-mormon/ >. The opposition to polygamy was hypocritical. Those lawmakers who routinely entertained intimate relations with women other than their wives established a law to make criminals of men who committed to love and financially support wives and children. These devoted husbands and fathers were ordered to have no further contact with their children or wives, and to leave these families at the mercy of charity. This was a violation of the prohibition of ex post facto (after the fact) laws as well as common sense and simple human compassion. DB…thank you for clearing up some inaccuracies as to Morman beliefs. As a JW, i was curious as to what your beliefs are and your reply gives me a better understanding. I just wanted to mention to the creators of this website that when considering the sources or references used to describe the beliefs of a certain religion, you will get much more exact, accurate and reliable facts by using the official website of that organization. I couldn’t help but notice that some of the sources are the websites of those who are “apostates” or those who are opposed or speak out incorrectly about Jehovah’s Witness beliefs. The web is full of inaccurate information about most subjects, however going directly to the source is beneficial. It’s no different than if for example you wanted information about a certain company, their product,what they sell, buy, etc., how the company is ran, or their policies and procedures, going directly to the company’s website is usually going to have the most amount of accurate and informative information about them. The official website of Jehovah’s witnesses is JW.ORG. There you will find the exact beliefs and answers to any question as to specific beliefs of the Jehovah’s witnesses, and a broader amount of information regarding just about any subject or question/answer regarding their beliefs, history, etc. That website is a great source for anyone that has questions regarding any and every topic about JW beliefs and exactly what those beliefs are based on. Specifically the scriptures that support those beliefs, and way of life. Thank you for your consideration in this regard! Felecia, your advice is so common sense yet so often ignored. I think part of the problem is superstition and distrust. Some fear they would incur the wrath of God if they visited another church or even went to that church’s website. Others believe they would only be deceived if they went to the source. I have been told Mormons do not believe in Jesus. When I point out that is the name of the church, I am told that is just to trick people into thinking we believe in Jesus. I have even been told we do not know what our church teaches, that the Big Evil Leaders have us all hoodwinked into thinking we believe in something nice when all along, we worship the devil (without knowing it, of course). And so the superstitious and fearful resort to the sources they trust, never imagining their pastor might be either misinformed or even dishonest. Both organizations are against what the Holy Bible teach. Most Churches do not teach nor practice what is required of them. Some might have elements of what the Holy Bible teach, while they omit some or most. The Holy Bible is the basis or foundation of the Christian faith and it must be adhered to in all situations! We do not have a choice! We Mormons, as the world likes to call us, love both the Old and New Testaments of the Holy Bible and are grateful for the witness of our Savior they provide. We also love the additional witness of Jesus Christ found in the Book of Mormon. To the earlier comments regarding the wisdom of going to the source, may I also encourage readers of this article and the subsequent comments to go to the source–read the Bible, read the Book the Mormon, visit the official websites of the Jehovah Witnesses and The Church of Jesus Christ of Latter Day Saints ( and ultimately ask God, who is the source of all truth, as directed in James 1:5–“If any of you lack wisdom, let him ask of God, that giveth to all men liberally, and upbraideth not; and it shall be given him.” This was great direction in the New Testament times, it worked in the spring of 1820 and it works today. God is the same yesterday, today and forever. He will answer your sincere prayers. Much success! God is The God of All and His Word declares: if “anyone” lacks wisdom, then just ask Him,and He is Not in the business of tricking people or lying. He will Show Himself!! Plain &Simple! ! Where much of discussing religion with certain sects/cults etc. presents a problem lies in the idea of a “testimony” as to the truth of a particular belief system. For example, the Mormon inquirer prays about the Book of Mormon after reading it and if they get a “warm fuzzy” feeling they will “know” the book is true. Jehovah’s Witnesses believe the Watchtower is God’s organization on earth and they are convinced their beliefs are true if they align with that. When an individual is inquiring into the beliefs of Islam they are told to read the Koran and God will let them know it is true. And so forth and so on. Every group believes they are in the “true” church. Therefore, asking God for a “testimony” becomes tricky since God is not a God of confusion but people can easily be confused. If you put members of different sects in a room they will all tell you that God told them their church was “true.” Therein lies the rub.